Now through May 31 receive $50 off the General admission with the discount code CAMP50. Nurture your creative spirit at Frank Lloyd Wright’s Oak Park Studio, where America's most famous architect pioneered a bold new vision for modern architecture and design. Building Story Through Design is a weeklong summer camp that explores ideas of narrative and storytelling through architecture, design, and photography. An accomplished amateur photographer, Frank Lloyd Wright used photography as a tool to document and promote his architecture. Photographs of his Home and Studio taken by the architect in the 1890s helped him to better understand ideas about architectural space and the design of his own buildings. Join other young designers as you explore Wright’s Oak Park design legacy with polaroid cameras, and then use your photographs to create a three-dimensional architectural model. During this weeklong camp, participants will have the opportunity to view original photographs taken by Wright as they document their own visual observations of the built environment. Become a member today and save $75 on camp registration! After you reserve your camp spot, you will be contacted by email with further registration information. Scholarships available on a limited basis. To inquire, please contact the education department at educate@flwright.org. 5 Sites + 5 Works, a day camp for high school students interested in creating original work. 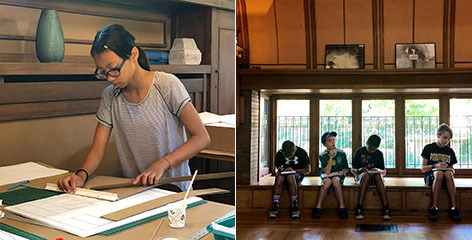 Young artists will visit 5 historic Wright sites in the Chicago area and create work onsite in 5 hours in response to their experience of Wright’s design.